This article is about goddesses who represent Liberty. For the statue created during the Tiananmen Square protests, see Goddess of Democracy. For other uses, see Goddess of Liberty. "Lady liberty" redirects here. For other uses, see Lady Liberty. The ancient Roman goddess Libertas was honored during the second Punic War by a temple erected on the Aventine Hill in Rome by the father of Tiberius Gracchus. A statue in her honor also was raised by Clodius on the site of Marcus Tullius Cicero's house after it had been razed. The figure bears certain resemblances to Sol Invictus, the late Roman Republic sun deity and the crown often associated with that deity often appears in modern depictions of Liberty. 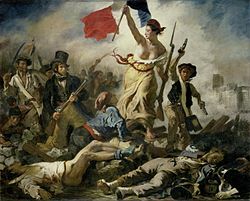 In 1793, during the French Revolution, the Notre Dame de Paris cathedral was turned into a "Temple of Reason" and, for a time, the Goddess of Liberty replaced the Virgin Mary on several altars. 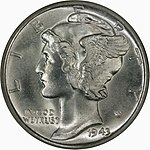 A young Liberty, with winged cap, on the Obverse of the Mercury Dime - designed by Adolph Weinman and issued in the US between 1916-1945. The Statue of Liberty (Liberty Enlightening the World), its replicas, and its portrayal on many U.S. postage stamps. Many denominations of American coins have depicted Liberty in both bust side-view and full-figure designs; see also Liberty dollar, Seated Liberty dollar, Liberty dime, Indian Head cent, and others. In the early decades of the 20th Century, Liberty mostly displaced Columbia, who was widely used as the National personification of the US during the 19th Century. ^ "Places We Call Home: Hackensack, N.J." FDU Magazine. Fall 2001. Retrieved 2008-11-04. Wikimedia Commons has media related to Liberty (goddess). This page was last edited on 26 February 2019, at 23:07 (UTC).